Winner of BookBrowse's 2009 Children's Book Award. When a fortuneteller's tent appears in the market square of the city of Baltese, orphan Peter Augustus Duchene knows the questions that he needs to ask: Does his sister still live? And if so, how can he find her? The fortuneteller's mysterious answer (An elephant will lead him there!) sets off a chain of events so remarkable, so impossible, that you will hardly dare to believe its true. When a fortuneteller's tent appears in the market square of the city of Baltese, orphan Peter Augustus Duchene knows the questions that he needs to ask: Does his sister still live? And if so, how can he find her? The fortuneteller's mysterious answer (an elephant! An elephant will lead him there!) sets off a chain of events so remarkable, so impossible, that you will hardly dare to believe its true. With atmospheric illustrations by fine artist Yoko Tanaka, here is a dreamlike and captivating tale that could only be narrated by Newbery Medalist Kate DiCamillo. In this timeless fable, she evokes the largest of themes - hope and belonging, desire and compassion - with the lightness of a magicians touch. In a highly awaited new novel, Kate DiCamillo conjures a haunting fable about trusting the unexpected - and making the extraordinary come true. At the end of the century before last, in the market square of the city of Baltese, there stood a boy with a hat on his head and a coin in his hand. The boys name was Peter Augustus Duchene, and the coin that he held did not belong to him but was instead the property of his guardian, an old soldier named Vilna lutz, who had sent the boy to the market for fish and bread. That day in the market square, in the midst of the entirely unremarkable and absolutely ordinary stalls of the fishmongers and cloth merchants and bakers and silversmiths, there had appeared, without warning or fanfare, the red tent of a fortuneteller. Attached to the fortunetellers tent was a piece of paper, and penned upon the paper in a cramped and unapologetic hand were these words: The most profound and difficult questions that could possibly be posed by the human mind or heart will be answered within for the price of one florit. An author makes a very important choice with the first line of any story. This story begins: "At the end of the century before last, in the market square of the city of Baltese, there stood a boy . . ."
Why do you think that Kate DiCamillo made this choice? How long ago is the story set? Peter has been given money by Vilna Lutz to buy food, but he spends part of it on a fortuneteller instead. In "Jack and the Beanstalk," Jack makes a similar choice when he trades his cow for five magic beans instead of selling it. Can you think of any other stories that begin with an errand that is waylaid? What makes this an effective narrative device? Feeling separate is a universal experience. Too often these days, we live behind picket fences, or triple-locked doors. We live behind stone walls or lines in the sand. We live behind fear or worry. The Magician’s Elephant by Kate DiCamillo is a story about people who break through these barriers - a story brimming with connection and the hope, love and, yes, even magic that comes from those connections. On the one hand it's a magical, faraway fable, and on the other hand a very present and real story, both woven together in the seamless way that can only come from Kate DiCamillo. (Reviewed by Tamara Smith). [T]he book begs for more than one reading and for sharing aloud. The quiet atmosphere and the tribulations of Peter are layered with a bit of pacifist sentiment and more than a touch of darkness. Younger children may miss the underlying themes, but no matter. Newbery Medalist Kate DiCamillo’s latest is a fairy tale, a mystery, a truly magical story of love and hope that will captivate readers young and old. Newbery Medalist Kate DiCamillo tells a timeless tale as "strange and lovely and promising" as her title character. The occasional illustrations, too, are dreamlike and magical. With its rhythmic sentences and fairy-tale tone, this novel yields solitary pleasures but begs to be read aloud. The absurdist elements...leaven the overall seriousness, and there is a happy if predictable ending. Starred Review. A quieter volume than The Tale of Despereaux and The Miraculous Journey of Edward Tulane, this has an equal power to haunt readers long past the final page. Starred Review. Tanaka's acrylic artwork is meticulous in detail and aptly matches the tone of the narrative. This is a book that demands to be read aloud. This book is so so so so so so so great! Anyone should like it! Even not good readers! The magician in The Magician's Elephant makes an elephant appear. But what about an elephant that disappears? 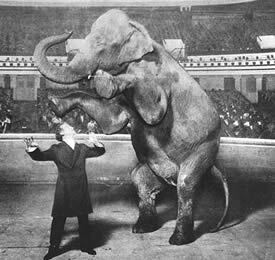 In 1918, Houdini made an elephant vanish from the middle of the Hippodrome Theatre in New York before over 5000 pairs of eyes. Jennie was an 8 foot tall, 6,000 pound Asian elephant and when Houdini brought her onto the stage she would raise her trunk as though she were saying hello to the audience, and then she would walk into a box on wheels - and disappear. Who taught Houdini how to do this magic trick? And how did Houdini do it?